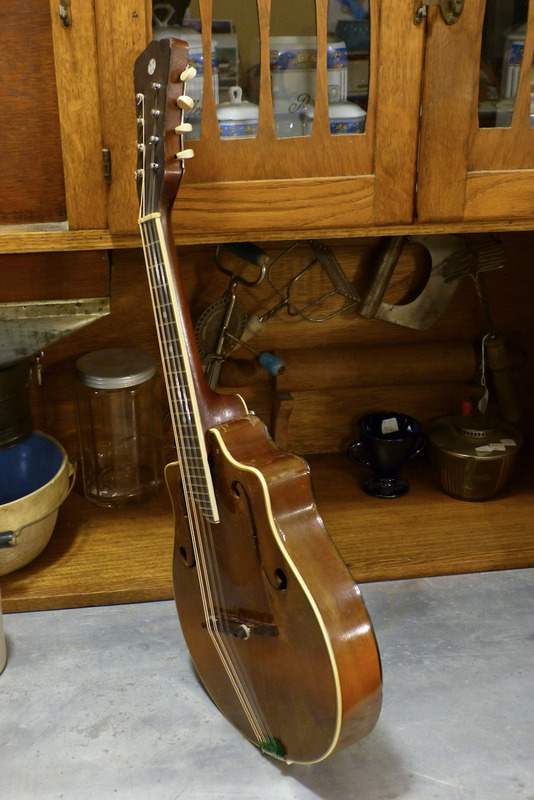 True, Kansas-made Shutt mandolins of this type are hard to come by, but the Harmony-made examples like this one (later called "viol" mandolins in catalogs of the era) are a little more common. The 14" scale, binding, and material choices on this mandolin place it in Harmony's mid-20s lineup, though the basic design was borrowed from Mr. Shutt's enigmatic mandolins of 1914 (which are appointed and built with a more Gibson look to their details). Some folks out on the net won't pin this particular Shutt-style design as a Harmony product, but having worked on dozens of same-period Harmony mandolins, I can say with certainty that it is. Just the neck's construction alone is enough to guarantee that. 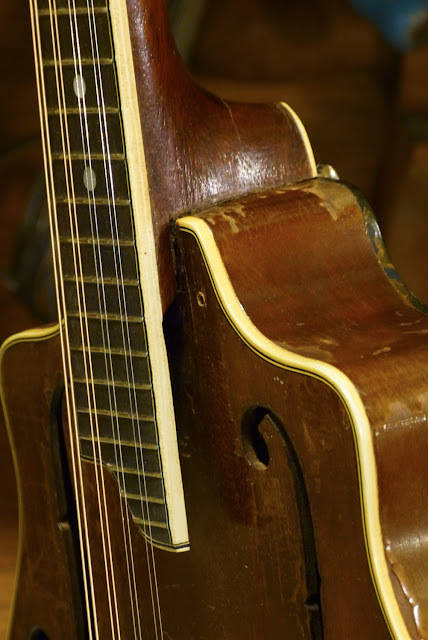 The basic "Shutt" design stipulates a top and back that are solid and carved like a violin (or Gibson mandolin, for that matter), though on these Shutt-style instruments both the top and back have no additional bracing. This is a benefit as well as a problem, since an unbraced, carved top will vibrate much more freely (which is why this thing is a dang cannon and has punch and cut like a modern carved-top) but that unbraced top is also less tuning-stable (since it can shift with micro-tuning more) and behaves a little bit like a banjo-mandolin in that regard. When you tune up one side to pitch, the other side needs tuning-up -- and back-and-forth until you get it in tune. Still, I've gotta hand it to the carving folks at Harmony -- this thing kills it sound-wise. 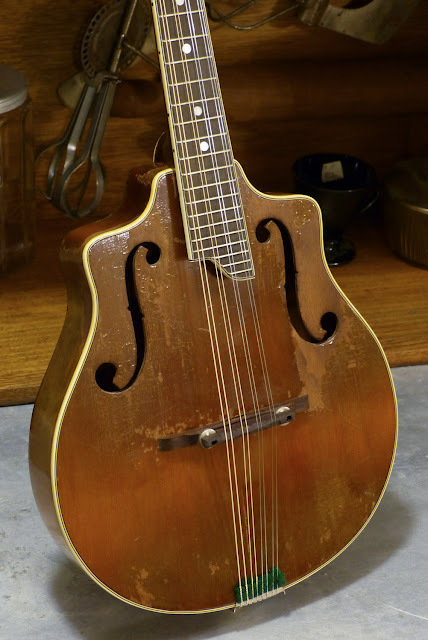 Like I mentioned before, it has a full, rounded, and gutsy tone that's more in-line with modern carved-tops than it is with period instruments. 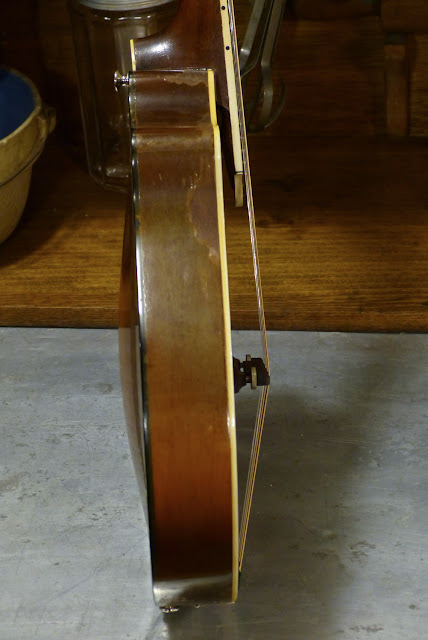 I repaired this for a customer and it came in with a badly-reglued neck joint that was pitched 20-degrees into the top and locked in-place with strands of some sort of nasty glue peeling off of it. This was absolutely awful to get apart and I still don't quite know what glue was used. 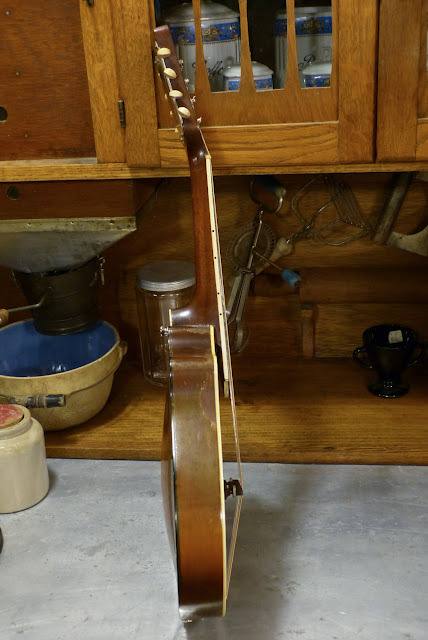 Once I had it off, I found a butchered, shimmmed, dovetail joint with gobs of random material inside and the stress of applying various pressure and chemicals to get the neck off put a crack in the lower part of the heel. It was a mess! The body, however, was in pretty good spec. Only one seam was loose and aside from that and the deteriorating finish, the body was good to go. 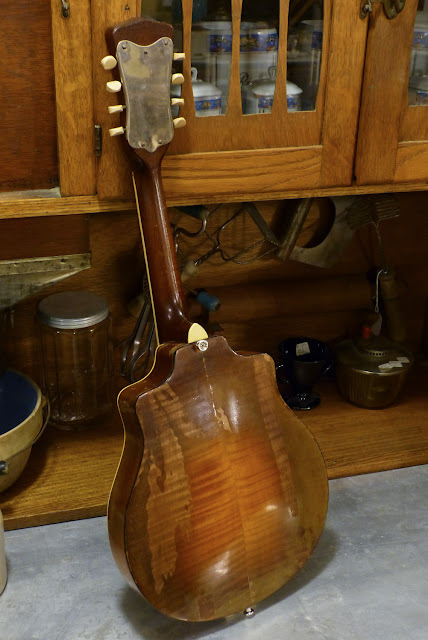 It features a solid spruce top over solid, flamed maple back and sides. 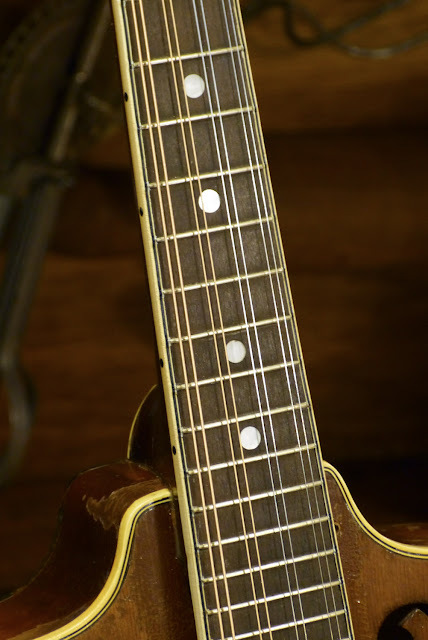 Like many Harmony mandolins of the time, the neck is solid mahogany with a dyed-pearwood fretboard and headstock veneer. The bone nut is original. 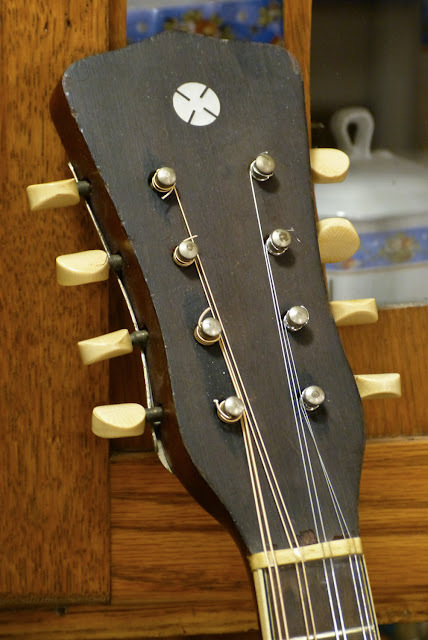 One frustration is that the tiny frets did not allow for a level/dress job that completely eliminated all relief from the neck. There's about 1/64" overall and it plays spot-on with 1/16" action at the 12th fret, however. In the future, a huge improvement for the instrument would be a board plane and refret. Unfortunately, the mando is missing its original pickguard. 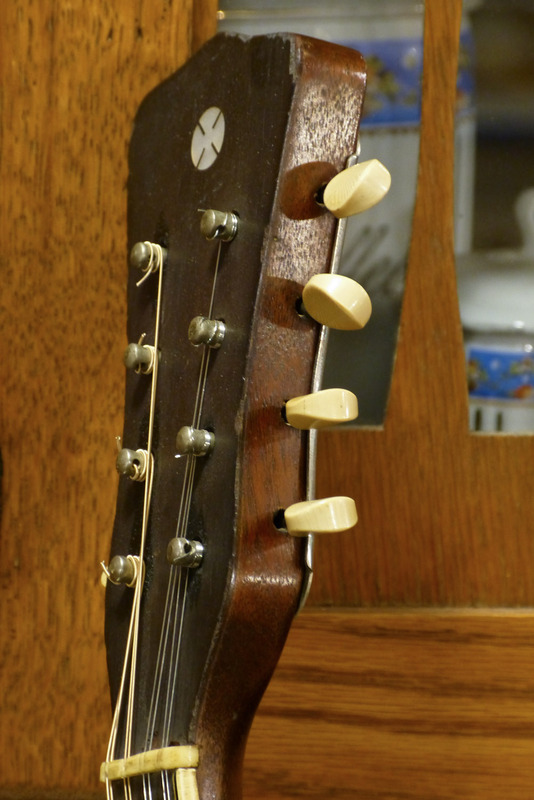 The rosewood, adjustable bridge is also a replacement. I had to also make/replace the saddle/topper of the bridge, too, as the "original" replacement had a big split in it. The flamed maple is pretty stuff, though the greening, blushed, and flaking-off finish gives it a very "grumpy old violin" presence. As usual, when Harmony installed the tuners, they neglected to screw the things down to the headstock, instead allowing for the backplate to somehow keep them in place. I, of course, added screws to the baseplates so they'd remain rigid when I went in there to lube the gears. Why the strap button? Well -- the dovetail joint was somewhat dramatically damaged in the heel the last time the neck was "reset." The old repair was finagled without much sense and without fixing missing material on the sides and bottom of the dovetail. 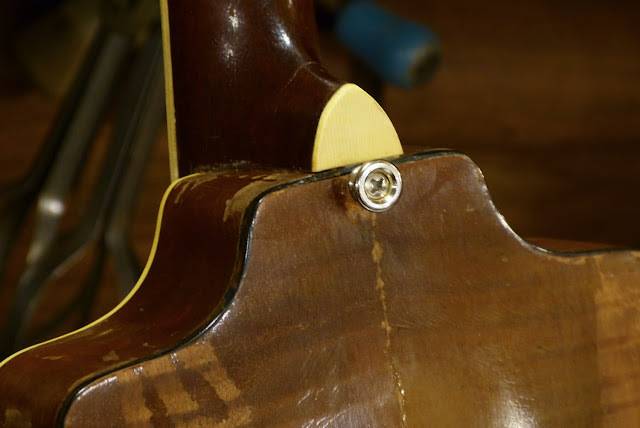 A traditional reset was not going to have half-a-chance of holding, so my solution was to reglue the damaged joint area with directional shims and then reinforce with a Fender-style "bolt" through the dovetail region of the neck. I needed something other than just the thin wood of the carved back and remains of the bottom part of the neck block to take the tension, so I installed a strap button to work double-duty as my "washer" for the bolt. The repair, thankfully, is doing well and holds perfectly -- it is, after all, glued and bolted. It's funny, though -- this week and last week have been filled with mandolin-family instruments that I've been neglecting to repair due to the fact that all of them have traumatized neck joints of one sort or another and need strange work-arounds to keep them in some sort of realistic budget. What one immediately notices when tuning-up from "totally slack" is that the top deflects down about 1/16" or so when tension is applied. This is the case with banjo-mandolins, too, and what I expected with an unbraced top. It's stabilized, however, at that lower level. You can see the swell of the two-piece carved back pretty well, here. 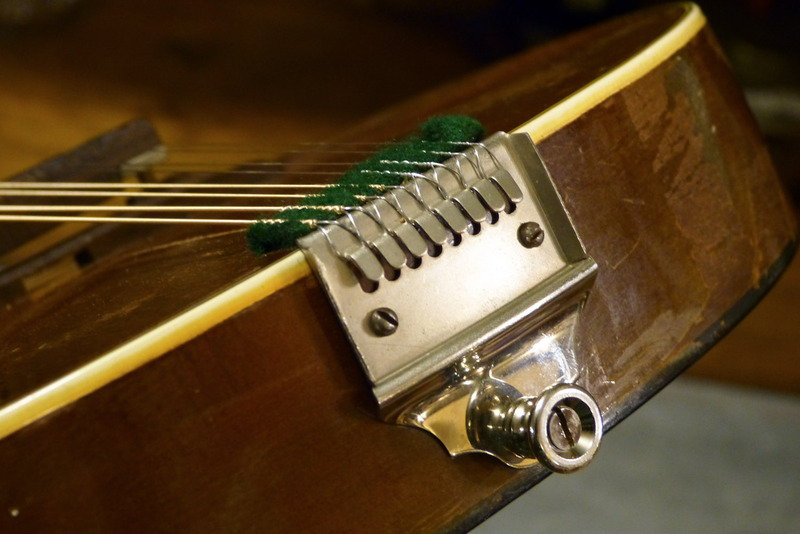 I added a matching strap button at the tailpiece and used some period green felt that was stuffed behind the tuners' coverplate to make a mute for the string-afterlength. I believe Harmony had excellent skills across the board in-house during its entire time in operation -- the problem being that they only sold X amount of high-end stuff that required those highly-skilled employees to continually be in service. It's possible that the employees who were doing the carving on the mandolins simply moved to the guitars later-on as the carved-top guitars became more popular and thus were more practical to market -- or that they simply picked-up new employees to build the guitars who had experience in that type of carving. I'm sure they could've pulled any number of skilled bowed-instrument workers around Chicago if they needed to hire them to carve guitars. 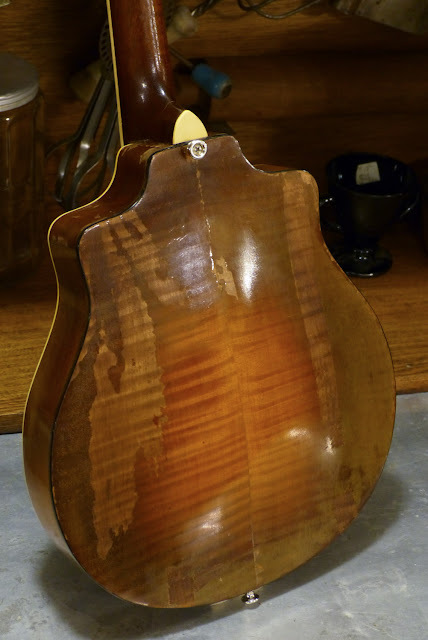 The two Harmony carved-tops I've worked-on have had tops that are more reminiscent (to me) of cello tops than they are to the usual carved-top guitars of the period. They're cut so dang light that they're right on the border of collapsing. I forgot to mention a reply on bought-in bodies. No, I don't think Harmony ever bought-in bodies of any sort. 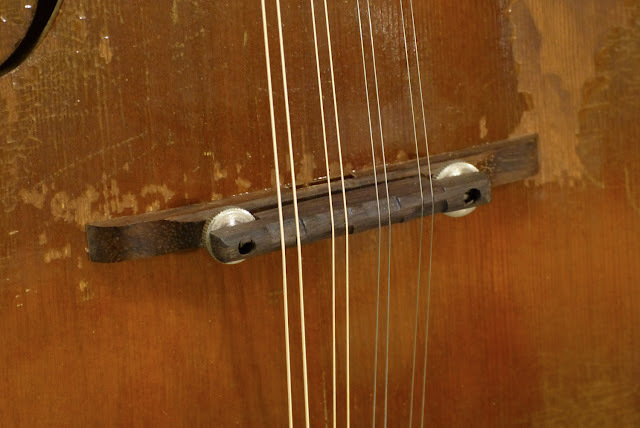 The workmanship and materials on the inside of this instrument (including the fabric reinforcement on the top/back) is in-line with other mid-high Harmony products of the time and the binding is very definitely the same stuff they normally used. 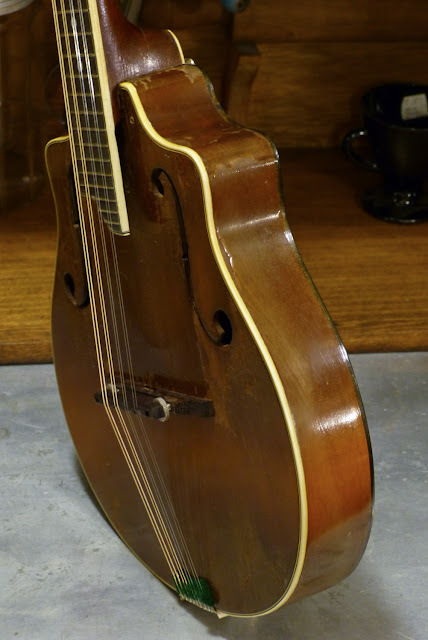 I have subsequently read that these are termed the Harmony Viol mandolin and first appeared in the trade press in the early 1930s. 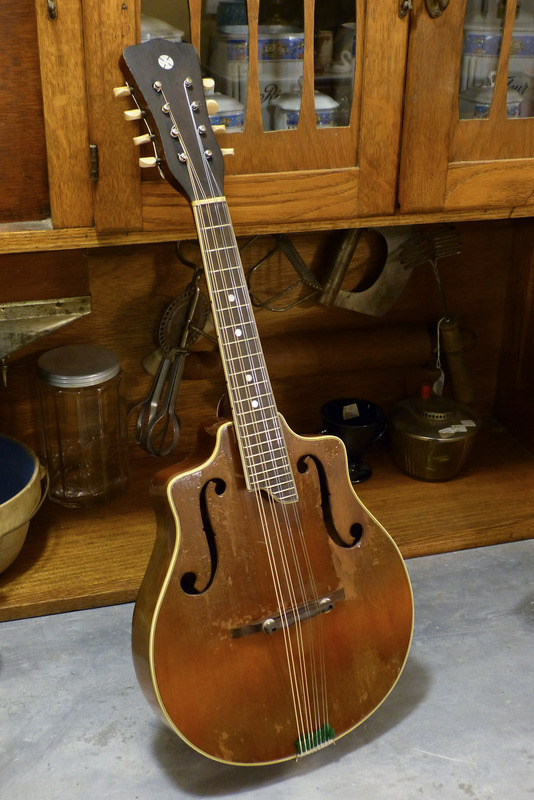 If this is correct- and it was published by a music shop that sold one and an earlier 1913 Shutt guitar*, then the hand-carving was done contemporaneously with the first Harmony archtop guitars- or thereabouts. 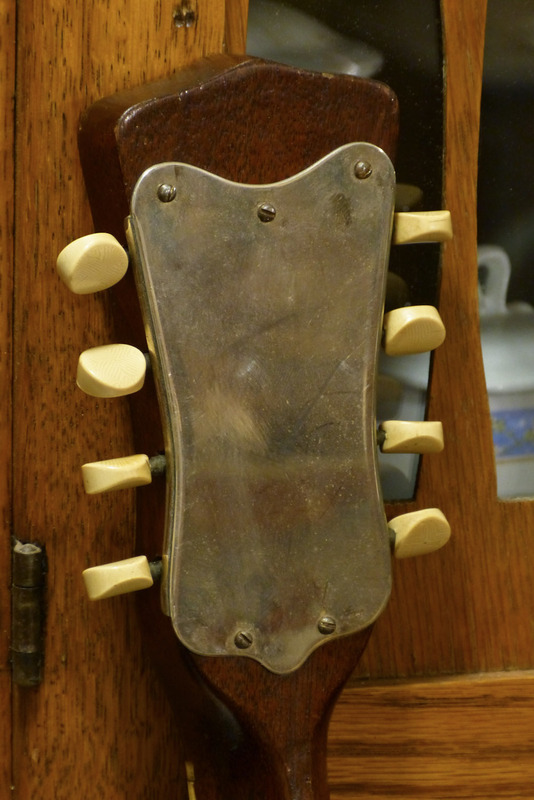 * "In the process of doing the reset on the guitar, Mr. Fallon found the following stamped on the neck block: MANUFACTURED BY THE HARMONY CO. CHICAGO ILL……." CORRECTION! That quote was what was found on the mandolin neck block- not the guitar! I have seen one of these Harmony Viols featured complete with the original Harmony label inside the body. 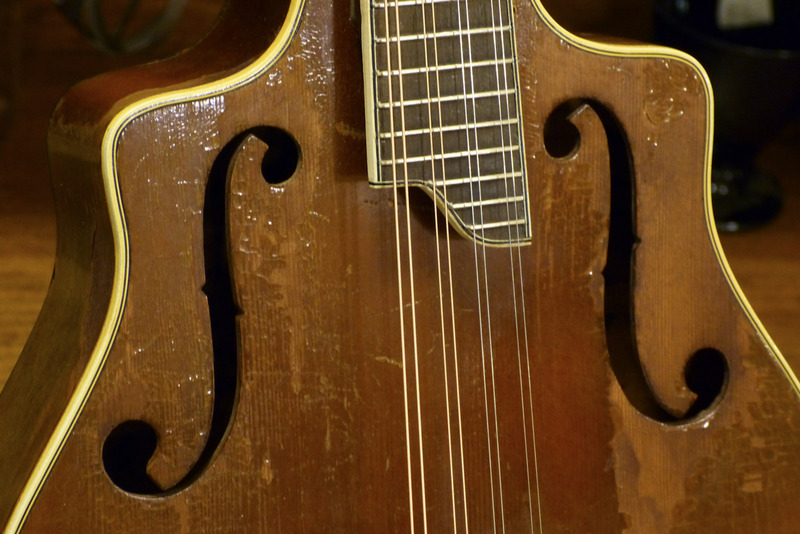 There is no doubt that these mandolins were made by Harmony. I got one just like the one you have pictured off of eBay. The top was really sunken in. I assumed it was a pressed top not carved. I took the back off, used a domed dish to ctadke the top in while gluing in a fairly small X-brace. It sounds pretty amazing - lots of volume but sounds sorta like a Gibson teens era A Mando, only much louder, did I mention that already.. haha! Thanks for your post and info I was unaware of. It's definitely a keeper!